This lunch is super fast, simple and easy to make. I haven't been grocery shopping yet for the week and I had to get by with what I had on hand to make this lunch. 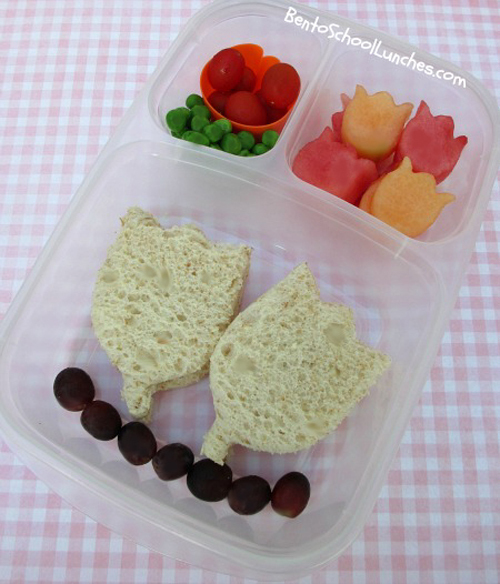 Tulip shaped SunButter sandwiches and seedless red grapes. Cherry tomatoes in a small tulip shaped cup and organic peas. Here are the supplies that I used to make and pack this lunch. Beautiful! and I love that you had watermelon and cantaloupe "on hand". Thanks so much Kathy! :) Watermelon is one of my favorites and a must have in my house,heheh! What a beautiful lunch! Tulips were my wedding flowers, so they always bring a smile to my face. I especially love the melon tulips!